Whether it’s pitching or hitting, the Washington Nationals are getting it done lately. On Wednesday, the Nationals became the third team in major league history to hit at least six home runs in consecutive games, joining the 2003 Los Angeles Angels and the 1996 Los Angeles Dodgers. They’re the first team to hit at least 12 homers over a two-game span since the 2007 New York Yankees, according to the Elias Sports Bureau. Two of those six homers were hit by 19-year-old phenom Bryce Harper, his second multihomer game of the season. According to Elias, Harper is the third player ever with more than one multihomer game in a season as a teenager, joining Ken Griffey Jr. in 1989 and Mel Ott in 1928. 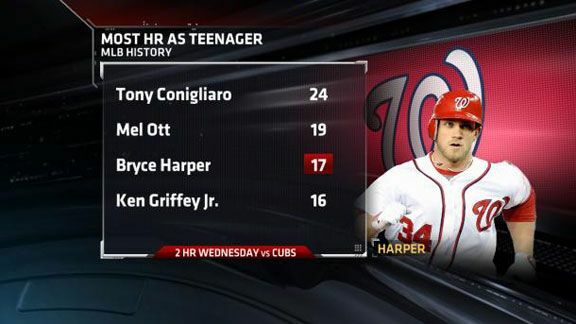 • Harper is the youngest player with 17 homers in a season since Tony Conigliaro in 1964. His 17 homers trail only Conigliaro (24) and Ott (19) for the most ever by a teenager. • How did Harper connect on the two homers? Both of Harper's home runs came on pitches in the outer third of the strike zone. He's been seeing more outside pitches as the season goes on. For the year, he's hitting .322 against inside pitches and .225 against outside pitches. But it wasn’t just the Nationals' bats that earned them a 9-1 win over the Chicago Cubs. Gio Gonzalez held it down on the mound. He’s the fifth Nationals/Expos player ever with 18 wins in a season and the first since Bryn Smith (18 wins) in 1985. How did Gonzalez get it done? • Gonzalez struck out six Cubs with his curveball and did not allow one to be hit in play. The Cubs missed on six of their 10 swings against it. • Forty-seven percent of his fastballs were in the bottom third of the zone or lower, his fourth-highest percentage of the season. Gonzalez got 15 outs with his fastball overall, and Cubs hitters were 0-for-7 in at-bats ending with a low fastball.